Tomorrow is Random Acts of Kindness Day. Each year on 17th February, individuals, groups and organizations, nationwide, celebrate this special day to encourage acts of kindness. Kindness costs nothing but it could change someone’s day. Even the smallest act could make a difference. Perhaps you decide to say good morning to everyone on your way into work and good evening on your way home. Maybe you bring in treats for your colleagues, spend time with someone who might be lonely, give blood, volunteer at a food bank, donate creative items, toys or games to a children’s hospital or let someone go in front of you in the queue. Think about the random act of kindness you could do tomorrow and how it may affect those around you. This week’s Pic of the Week is a perfect example of a random act of kindness. Smiling at those in the street, especially those on the outskirts of society, is such a small, effortless thing to do, but it really could make someone feel less invisible. 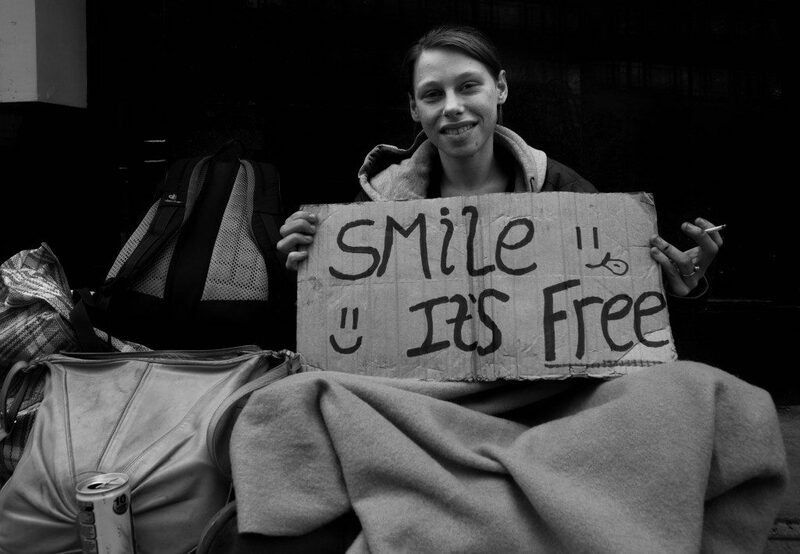 This picture was taken by Ian Walker in London and is called “Smile, it’s free”. It was originally submitted to our Streetscapes catalogue.